Put your hands on your hips as in the picture below. Keep feet hip width apart or even closer. Shift your weight onto one foot and slowly lift one foot a couple of inches off the floor. Hold this position for 5 seconds and then slowly return your foot to the floor. Use your glutes to keep your hips level. Set your abdominals to support your spine. Start by raising only your heel until you are comfortable with shifting your weight. Put more air in your exercise ball. Once you've mastered the "reverse bridge" on the stability ball reduce your base of support by lifting one foot as above while maintaining pelvic stability. 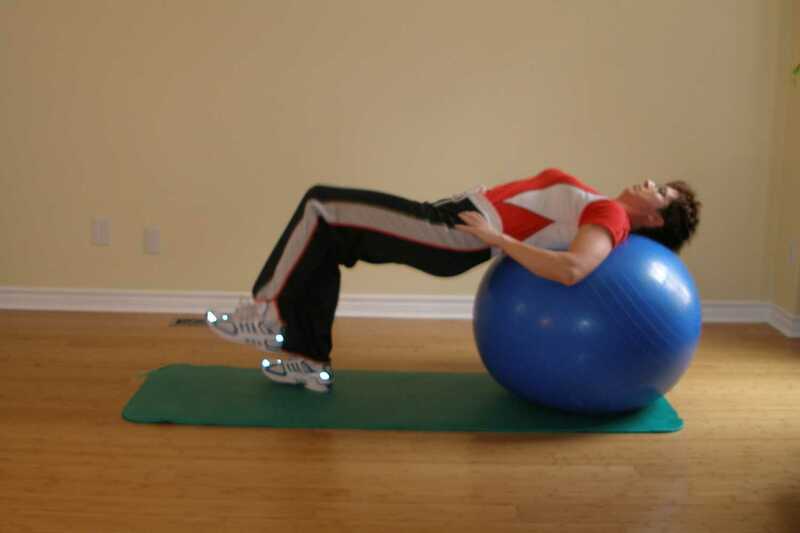 During this exercise your pelvis should remain level such that if you were to put a broom handle across your hips it would not move when performing this ball exercise. Repeat this exercise ball exercise 6 times on each leg. Repeat this exercise ball exercise 10 times on each leg. Repeat this exercise ball exercise 15 times on each leg.